Kerry got out of jail yesterday when the Monaghan guards were distracted by the singing of the Fat Lady. 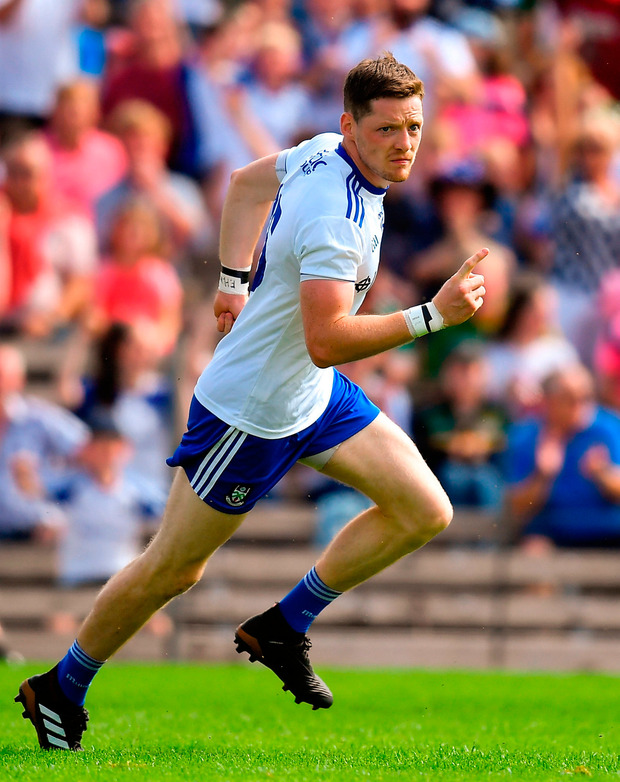 Monaghan drove on from the start, and if there was a drumlin in the way, it was flattened. Conor McManus is one of the greats, already, even if he were to retire tomorrow morning. Rory Beggan kicked the ball perfectly and Ryan McAnespie brought so much honour to the memory his uncle, Aidan, who was shot dead by British soldiers on his way to watch a GAA match. Monaghan were the better team, even if referee Maurice Deegan will never be invited to judge the Rose of Tralee. We were very lucky but Kerry do have a history of last-minute goals. Think back to 2014 when Kieran Donaghy laid it up for James O'Donoghue to deny Mayo. Donaghy's clever knock-down was no accident. David Clifford was under the tree for the dropping fruit and he snuck it through the only alleyway in the crowded goal area. Donaghy and Clifford are pals. They discussed this plan. The young lads did well yet again. This week Tom O'Sullivan came through. There is hope and hope is the mother and father of all that is good and glad. So it is then that the 'Super 8s' goes to the last round without any mourning for a dead rubber. The Dubs are the best fun. While the trip to Tyrone didn't exactly equate to a road trip on Route 66, there was an element of "isn't it great to get away?". The pubs told me the Dubs spent all around them. Porter is so dear in Dublin that a day away makes for great savings. Shane Ross should reverse the rural bus scheme and arrange for buses down the country. There wasn't a flask to be seen, nor a packed lunch. It's only a matter of time though before the Dubs get cute and start dropping in to say hello to unsuspecting country relatives around dinner time. Their team deserved to win too. Dublin can play you any way, rough or clean, and every man among them is a natural footballer, especially the backs who score like forwards. Tyrone suffered more when Healy Park was turned in to Subbuteo Stadium. In a place where borders matter, the pitch was made small. Tyrone were the better team when play opened up near the end. And, as usual, the referee seemed to lose perspective in the last few minutes. I brought in an undercover inter-county referee who travelled some distance to review the tapes. Here is his appraisal of the last three minutes. "67th minute: Kieran McGeary fouled twice in front of Dublin goal. Ref hops the ball. 68th: Mattie Donnelly clearly fouled in kickable position. No doubt, 100 per cent sure. 69th minute: Cathal McShane fouled in front of goal. Clear free." The GAA must examine why the awarding of tight decisions to Dublin is the norm. I'm not suggesting any collusion. It could be there is some psychological imperative driving decisions. Referees are human after all, and so are not immune to installing opinions that they do not consciously import in to their thinking process. But, if needs be, Dublin could have quickly transformed in to an all-out attack. Paul Flynn got the last score to prove the point. He came on for Bolshoi Brian Howard who could pirouette on the point of the Spire. Howard's way is always forward and he is a huge find. Dublin won a game away from home against a team they wiped out last year in Croke Park. But win they did. Maybe the lads at Congress might decide to make them play the semis down the country, because the playing of home semis by one team, really does down the country. Dublin are still the best team, by some way. Tyrone are now drawn away from home against Donegal in Ballybofey. Donegal are hard enough to beat anyone, anywhere. The system only works fairly if there is home and away against the same team. The winning of All-Irelands should not be down to the luck of the draw. All 'Super 8s' should be played in neutral venues. Galway mixed the ugly with the beautiful against Kildare in Newbridge. Damien Comer was unstoppable. Back in the old days, big strong men were bullocks but Comer has all the skills. He's the Buffalo Bill of the GAA. Galway are getting better with every game. But you would have to feel for Kildare. This summer the team changed the name of a town. No one says Newbridge. It's Newbridge or Nowhere. Like the salmon, we will finish up where we started out from. Patrick Kavanagh, the former net minder from Inniskeen in Monaghan, is surely composing a lament for the Fat Lady. It seemed like the day. Kavanagh surely, finally, would get over that desperate dose of unrequited love he rhymed about on Raglan Road. "I made the Iliad from such. "A local row. Gods make their own importance." And there is no game more important or more local for Monaghan than the next day out against Galway. The words from the poem are Kavanagh's. We have robbed enough from Monaghan for one day.